I do not believe in ghosts, but, having witnessed a most remarkable, altogether inexplicable event, that happened to me when I was but a boy of eleven, near the burial ground of the Ancient Church in Toxteth, I have, finally, been persuaded at the request of a number of friends, to document the following particulars of the same; for, whosoever wishes to dwell upon this account, may find that it has more than ordinary interest. The day was Good Friday and I had gotten up early to see the ‘Judas burning’, up against the wall of a derelict house in Charlecote Street. I say ‘I’, but I wasn’t doing the burning; I was simply watching some older lads lighting their effigy, but, as is wont to happen when youthful recklessness abounds, it wasn’t long before the police arrived — a pair of them, on a motorcycle and sidecar would you believe! We all scattered but for some reason they decided to chase me. I must have run for miles when, finally, I got cornered by the same two policeman. They had caught sight of me disappearing down a blind alley, and, at the end of it, had found me cowering amongst a pile of bins and rusting barrels. One of the coppers informed me that Charlie, one of the older lads I mentioned earlier, had told them it was me who had started the burning. At first he was suspicious of the story — an older boy blaming someone younger — but it wasn’t long before the crowd of boys, now gathered around him, had all begun chiming in agreement that it was me who had started the fire. Anyway, I pleaded with him that I wasn’t to blame, and, after some questioning, he let me go with no more than a ticking off. I think both men had felt sorry for me; they could clearly see from my shaking and mumbling that I wasn’t someone who was likely to be the ringleader of a gang of trouble-makers, especially ones older than me! Still, I was quite upset that I had been implicated in all this. By then it was getting quite late. So I set off home to my house in Cockburn Street. I was proceeding leisurely on foot when, on passing the Ancient Church, my attention was suddenly arrested by the strange and uncanny appearance of its graveyards. The time would then be shortly after ten. The whole burying ground seemed alive and glistening with a thousand small blueish lights, like little flames, which appeared to creep in and out of the different graves, as if the departed spirits were taking a late evening ramble. I stood petrified, not knowing what to make of it, at the same time experiencing a feeling of horror which suddenly took complete possession of me. Just at this moment the moon, which had up until then been more or less obscured by a moving panorama of passing clouds, came, as it would seem, to my assistance, giving me for a very short time the benefit of her companionship. And now appeared the most startling phenomenon of all, a phenomenon which caused my hair to stand on end with fright, a cold numbness of horror, paralysing me in every limb — for advancing up the road, directly opposite to me, came a funeral train, the coffin borne along with measured tread, covered with an immense black pall, which fluttered up in the evening wind. At first I thought I must surely be dreaming, and therefore pinched myself in the arm to ascertain if this were really the case. But no, I certainly was not, for I distinctly felt the nip, and was therefore satisfied as to my wakefulness. ‘What could it all mean?’ I asked myself as the cortege gradually approached me, and I began to distinguish the general outlines of the bearers. These appeared to be no more than boys, judging by their size, but they were indistinct, merely shadows of the human form. The most disturbing part of it was that they all bore walking-sticks mounted with deaths’ heads. I observed one somewhat younger boy among the crowd of followers, walking just behind the coffin. His distinctness, in comparison with the others, perhaps made me take especial notice of him. He was dressed in what appeared to be a suit, black velvet; the whiteness of his shirt standing out in marked contrast to the sombre nature of his general attire. The face of this young man was deathly pale, as were also the faces of all the others accompanying him, and, though his face remained somewhat blurred in form, I felt that there was something strangely familiar about it. Then, suddenly, instead of the procession advancing to the gate at which I stood, it turned and entered the burial ground by the one situated at a few yards’ distance. As the coffin was borne through this gate, all the blue spirit lights seemed to rise from the graves as if to meet the cortege for the purpose of escorting the body to its last resting place. These awful lights added considerably to the ghastliness of the scene as they floated over the coffin and heads of the mourners. Slowly the procession glided up the pathway, passing the main entrance of the church, and, continuing its way in a straight line, finally disappeared at the back of the edifice. Where this most extraordinary funeral went to or what became of it, I cannot tell; but this much I distinctly aver, that coffin, mourners, and lights — even the pale flickering moonlight — all disappeared as mysteriously as they came, leaving me standing in the darkness, transfixed with astonishment and fright. Upon gathering together my somewhat scattered senses, I took to my heels and never stopped running till I found myself safe in my own house. In fact, I scarcely remember how I got home. After recovering a little from the shock I immediately aroused a female relative who had retired for the night, and related to her the above particulars. She assured me that I must have been suffering from mental hallucination, but, seeing the great perturbation of my mind, she came to the conclusion that, after all, I might possibly have seen what has been described above. The next day she made enquiries at the neighbourhood, and ascertained from a very old woman that she remembered a story in her youth having reference to the mysterious and sudden death of an old churchgoer, who ,was hastily and quietly buried, she thought, at evening time, in the old churchyard. If so, was this a ghastly repetition of the event got up for my special benefit, or was it a portent intended to foreshadow the coming of the Dread Visitor to myself? Now, as I have before stated, I am not a believer in ghosts, but, certainly this very remarkable experience of mine has entirely upset all my previously conceived notions of the subject, leaving me in a quandary of doubt. On the evening upon which I saw the mysterious twilight funeral at the Ancient Church, I was exceedingly wide awake; I had passed several cyclists on Dingle Lane, with whom I conversed, and had likewise refreshed myself at the public drinking fountain placed at the top of The Mount. Strange that a few thousand yards further down the road I should encounter so ghostly an experience – an experience I shall, to my dying day, never forget. And, what of the burning of the effigies? Well, that dwindled out shortly after the war. Too many accidents, I suppose. One of the boys in the neighbourhood ‘got it’ not long after my encounter in the churchyard. The silly beggar had used petrol ! My dad read it in the papers — a gruesome report, too, saying ‘his charred remains were found amongst the debris of the Judas’. I think it was Charlie. Dad said I went to the funeral, not that I can remember. I wrote this story after Tim Shewan alerted me to the custom of Judas Burning, prior to which I was entirely ignorant. Its practise in the streets of Toxteth, Liverpool, in celebration of Good Friday, was quite a singular event for the British Isles, even in the early part of the 20th century; for this custom had – and, possibly, still has – a much greater significance in the lives of our European cousins: those in Germany, Spain, Portugal and Greece. You can read more about this fascinating custom at the BBC Liverpool website: Judas Burning. 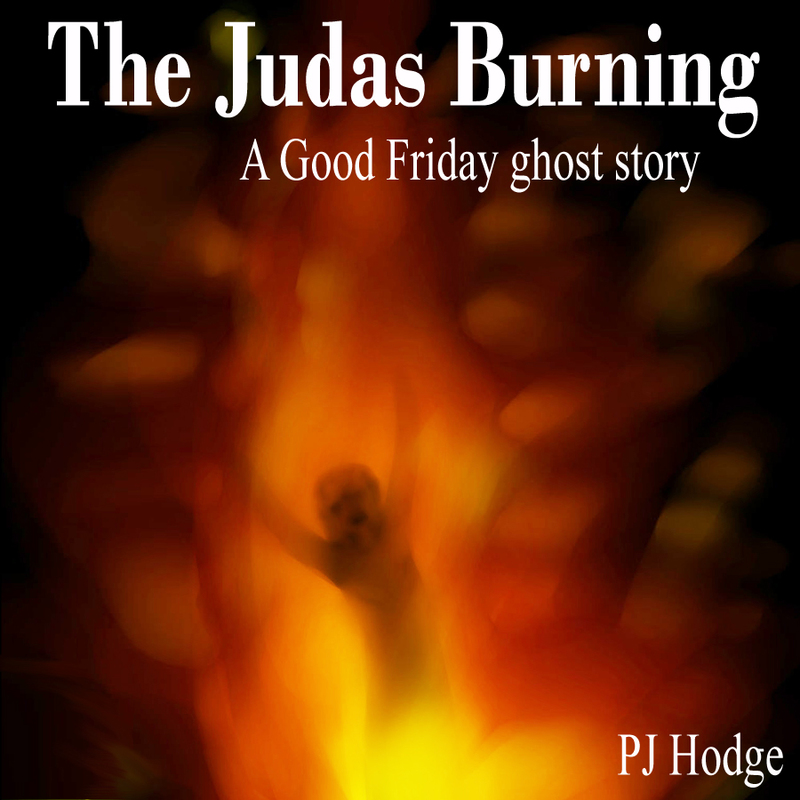 This entry was posted in easter, ghosts, good friday, horror, paranormal and tagged burning of judas, burning of the judas, judas burning, liverpool ghosts, liverpool hauntings, toxteth ghosts. Bookmark the permalink. Nice! Sounds like Interdimensional activity in the story. Death premonitions.